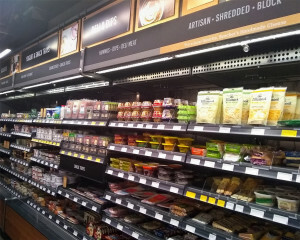 In 2016, Amazon announced Amazon Go – a chain of grocery stores that are completely unattended. Today, there are 9 active Amazon Go stores in cities including Seattle, Chicago, and San Francisco. 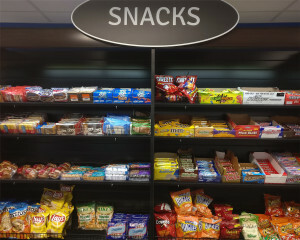 This unattended, convenience-store environment alarmed vending operators. After all, these stores sounded a lot like Micro Markets, and how are operators supposed to compete with Amazon? The good news is that the technology behind Amazon Go is incredibly expensive. Computer vision, deep learning algorithms, and high-tech sensors are required to run a store. Plus, Amazon Go stores require a large footprint to be profitable – over 1800 square feet to operate. 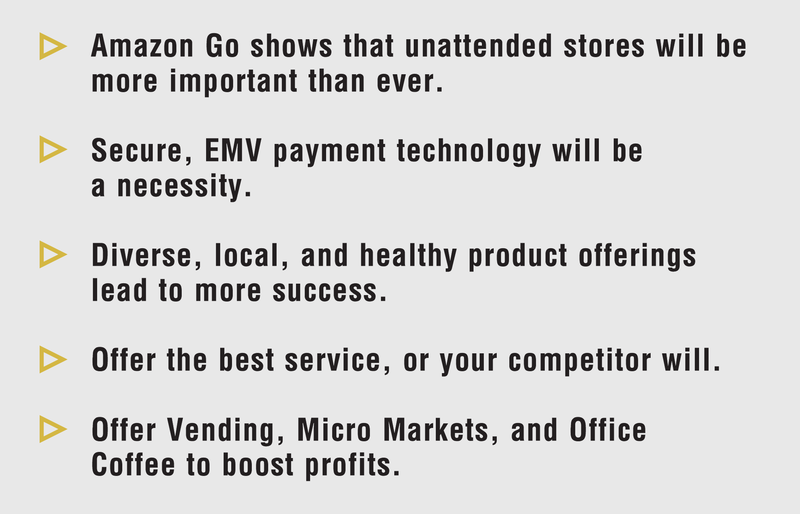 So, common market locations like office breakrooms, or factory lunchrooms shouldn’t be threatened by Amazon Go. Vending trends like the advent of Amazon Go can actually help vending operators. The concept will teach consumers en masse how to use self-checkout systems. The more comfortable customers are with self-checkout, the more accepted and profitable Micro Markets can become. If anything, the coming of Amazon Go should signal to operators that unattended stores (like Micro Markets) are a significant and profitable part of their future. Payment technologies are vending trends that are always evolving. First came coin mechs, then bill validators, and ultimately cashless readers. However, cashless payments are still changing. Now? Apple Pay and Android Pay are accepted on many cashless readers. So what is next? EMV, also known as dip payments, is on its way in vending. EMV is already a predominant cashless payment method used in retail – they made up 41% of cashless payments in 2017 and 90% of credit cards in the US have chips. Why is EMV so important? Security. These dip payments are much more secure than their swipe counterparts. So far, vending has been exempt from transitioning to EMV payments due to a lower risk of fraud. However, as EMV gets more popular, swipe payments run the risk of being phased out completely. And as customers get more comfortable with EMV they’ll prefer to pay with it wherever they go – including the vending machine. Did you know that 58% of American Consumers agree that it is important to eat healthy? Plus, local food sales grew from $5 billion to $12 billion between 2008 and 2014. And 48% of millennials will spend more on a meal that features a new or innovative flavor. The point is: consumer tastes are changing. The staple products in vending are unlikely to change in the short term – soda, chips, and energy drinks are staples of the industry. But operators should pay attention to product trends. Keep a few selections open for healthy or local foods open in your machines. Try a wide range of food in your markets. 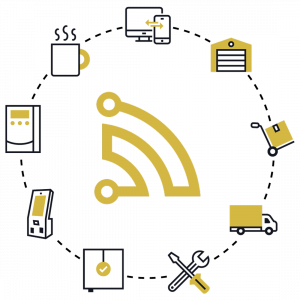 If you have a solid VMS, staying on top of product vending trends is much easier – you can easily track what sells and what doesn’t in your markets or machines, which lets you test different products out until you find the right mix for your location. Millennials are entering the workforce, and they are far more picky than their older counterparts. A report states that 27% of millennials have written a negative review – compared to 16% of baby boomers. This younger generation expects a high level of service and won’t hesitate to go elsewhere if they have a bad experience. So, it’s imperative that operators offer excellent customer service. If you don’t, younger customers just won’t buy from you – plain and simple. And if enough people complain, you can bet your location will find another operator who is willing to go the extra mile. Check out our video, 5 Ways Customer Service Can Impact Your Business, for tips on satisfying your customers. Do you offer vending services? How about Micro Markets or office coffee? If you want to maximize your revenues, you should consider offering all three services. The more services you can offer to a location, the more money you will see. Plus, if a location is locked into more than one service with you, the chances of you losing the account are much smaller. It is easier for them to replace just vending services than to replace vending and coffee and markets. See how an all-in-one technology provider can help you manage all of these business lines effectively.